Mangosteen (Scientific name: Garcinia mangostana) is called the “queen of the tropical fruits”. Each fruit is about the size of a small orange. It has a beautiful exotic, purple color thick skin, with snow-white, juicy, delicious arils. The fruit has between four to ten juicy, fleshy, triangular segments, like the inside of an orange or lemon. Each piece contains a few off-white colored seeds that are not edible and that taste bitter. The texture of mangosteen flesh is soft like cherimoya flesh, except that the mangosteen’s has a form. The fruit has been described as sweet, aromatic, and delicious. Mangosteen is low in calories and has no saturated fats or cholesterol. It is very rich in dietary fiber, a good source of vitamins A and C, and a fair source of B-complex vitamins such as thiamine, niacin, folate, pantothenic acid, pyridoxine, riboflavin. It also contains an excellent amount of minerals like calcium, copper, iron, manganese and magnesium, phosphorus, and zinc. Mangosteen has phyto-nutrients such as carotene-A, carotene-beta, and cryptoxanthin-beta. Acne: The natural antibacterial properties and antimicrobial compounds of mangosteen are very effective for healing the gut that leads to healing of many common skin problems, such as acne, skin blemishes, oily skin and dry skin. Anti-Inflammatory: The anti-inflammatory properties are extremely beneficial for individuals who are suffering from sciatic pains which cannot be controlled by pharmaceutical treatment. Consuming a few mangosteens a day may help relieve the pain because of its cox-2 inhibitor effects. Antioxidants: Mangosteen contains a class of naturally occurring polyphenol compounds known as xanthones. Xanthone derivatives alpha and gamma-mangostin have proven to have superior anti-inflammatory properties. Xanthones are an excellent remedy against various cardiovascular diseases, can heal cells damaged by free radicals, slow the aging process, ward off degenerative diseases, and prevent physical and mental deterioration. Blood flow: Mangosteen helps promote red blood cells and protects against anemia. It can improve blood flow by causing dilation of blood vessels that helps protect against atherosclerosis (hardening of the arteries), high cholesterol, heart congestion and severe chest pains. Blood Pressure: The high mineral content like copper, manganese and magnesium as well as potassium provides protection against strokes and coronary heart diseases. It is a vital component of cell and body fluids and controls the heart rate and blood pressure. Cancer: The high content of antioxidants found in mangosteen are helpful for preventing cancer. The powerful and effective antioxidants protect the body from free radicals that cause oxidative stress that can lead to severe medical conditions. Cataracts: Since mangosteen helps increase blood flow to the eye and it has high content of antioxidants, it can protect against cataracts and improving vision. Cold and flu symptoms: Mangosteens are rich in vitamin C which is powerful water soluble antioxidant; vitamin C offers protection against flu like infections and scavenges harmful pro-inflammatory free radicals. Menstruation: Eating this delicious fruit few days leading to menstruation may reduce premenstrual symptoms such as dizziness, mood swings, and hypertension. 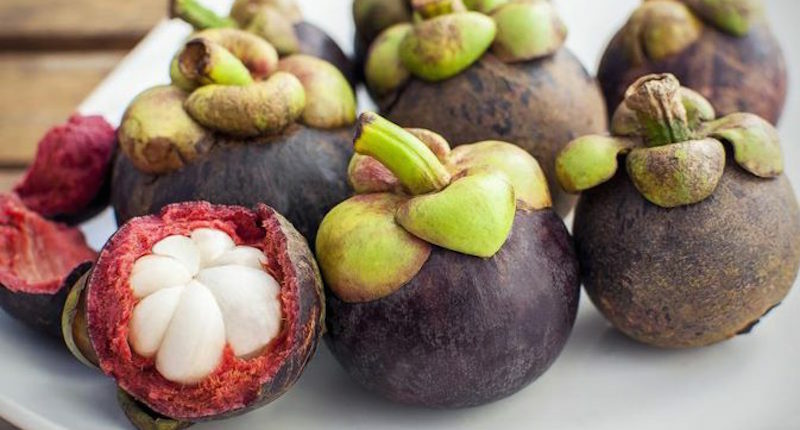 Tuberculosis: Mangosteen contains strong antibacterial and antifungal properties that heal the gut and immune system, making it beneficial in boosting a weak immune system. Its inhibitory action against harmful bacteria may be effective for patients suffering from tuberculosis. Weight loss: The xanthones in mangosteen skin is used for weight loss and preventing weight gain, as it is effective for burning fats. Mangosteens have been the focus of many anti-cancer studies and the results have so far, been very positive. A mangosteen fruit was found to contain at least 20 known xanthones that have cancer-preventive effect on lab animals. A study conducted by the Department of Pharmacy Practice at the University of Illinois at Chicago College of Pharmacy found that mangosteen can successfully slow the growth of prostate cancer cells and tumors. The International Journal of Oncology published a study in 2016 that indicated that alpha-mangostin induced programmed cell death of cancer cells. It was concluded that this polyphenol may be used as a food supplement, as well as a potential therapeutic compound for breast cancer. A study published in Food and Chemical Toxicology examined the anti-skin cancer properties of crude ethanol extract of mangosteen pericarp on human squamous cell carcinoma and melanoma. The mangosteen extract showed strong anti-skin cancer effects on both skin cancer cell lines, showing its potential as skin cancer natural treatment. Xanthones from mangosteen extracts is shown to be a natural chemo-preventive agent and has potential as anti-cancer drugs. Xanthones from the pericarp, whole fruit, heartwood and leaf of mangosteen are known to possess a wide spectrum of pharmacologic properties, including antioxidant, anti-tumor, anti-allergic, anti-inflammatory, antibacterial, antifungal and antiviral activities. Look for fresh mangosteens that have skin in dark reddish color. The blue-black ones are far from ripe. They should feel heavy for their size. Avoid fruits that have dry and blotched skin. Be careful when buying them directly from the farmers as mangosteens often attract ants and they may hide under the “green petals” at the stem. Ripe fruits if uneaten should be stored away whole in the refrigerator to prevent them from further ripening. Consume within a week. Fresh mangosteens are delicious to be consumed alone or complement with other tropical fruits like durian, papaya, watermelon, pineapples or grapes. Because of the seeds, mangosteens cannot be juiced. Due to mangosteen’s anticoagulant properties, consuming mangosteen might increase the risk of bleeding in individuals who are on blood thinners or have blood disorders. If you are scheduled for surgery it is important to stop taking mangosteen at least two weeks before your procedure.